Q: Which vehicles can be smog tested at Napa Smog Test Only? Cuales vehiculos pueden ser certificados en Napa Smog Test Only? A: All vehicles, including regular smog, STAR directed - cars, trucks, vans, SUVs, RVs, desiels and gas-powered. Todos los vehiculos que necesitan "Smog Test" o "STAR Station Smog Test" - carros, camiones, SUVs, RVs y cual quiera carro de gasolina/disel. Q: My letter from the DMV says I need to go to a STAR Certified Smog Station. 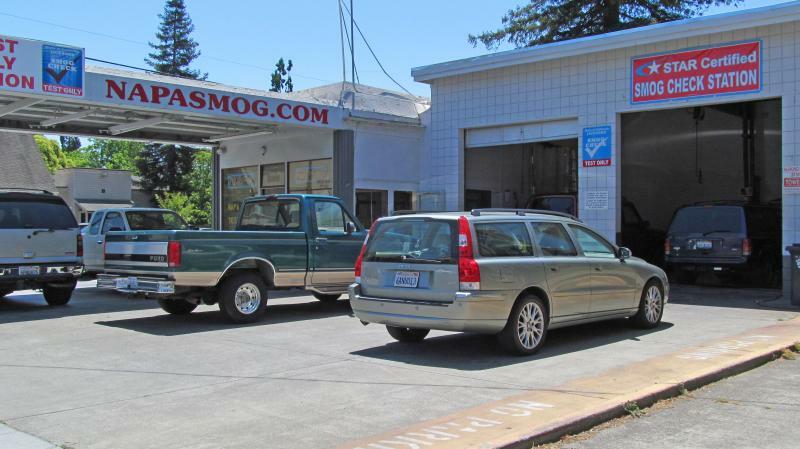 Is Napa Smog Test Only one of those stations? Mi letra del DMV especifica que tengo que ir a una estacion de "STAR Certified" - Napa Smog Test Only es una estation "STAR Certified?" A: Yes, Napa Smog Test Only is one of the selected stations authorized to do STAR-directed vehicles. 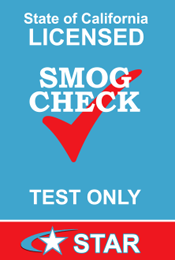 We do not charge an extra fee for STAR-directed smog tests. Si, Napa Smog Test Only es una estacion autorizada "STAR Certified" y no se cobran cargos addicionales por aser el servicio en una estacion "STAR Certified." A: Test Only stations like Napa Smog Test are licensed Smog Check stations that do not make repairs, eliminating any incentive to fail a vehicle without proper cause. Una estacion "Test Only" es una estacion licensiada de Smog Check que nomas es autorizada para hacer la prueba de smog. La ley del estado prohibe que haga qualquier tipo de reparo, eliminando qualquier intentivo de fallar una prueba sin causa propia. A: Your annual registration renewal notice sent by the California Department of Motor Vehicles (DMV) will say your vehicle must be inspected at a STAR Certified station. ﻿The STAR Program selects some vehicles for testing only at STAR Certified Stations. They may be randomly selected or STAR-directed due to model or age. Su formulario de renovacion anual que le manda el Departamento de Vehiculos con Motor (DMV) dice que su vehiculo debe ser inspeccionado en una estacion "STAR Certified." El "STAR Certified" programa selecta vehiculos para examinar al azar. Serian escojidos por el ano del modelo/carro. A: Yes. 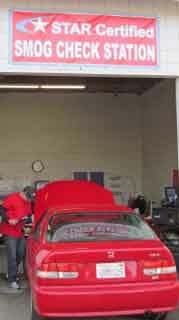 Diesel vehicles 1998 and newer weighing less than 14,500 GVW need a smog check – a change that began January 2010. Napa Smog Test Only performs smog tests for diesel vehicles. Like gas vehicles, the test is required every 2 years. Si.Vehiculos diesel del ano 1998 y mas nuevos pesando menos de 14500gvr necesitan un smog check, un cambio que empezo en Enero 2010. Napa Smog Test Only hace el smog para vehiculos diesel. Como los carros de gas, es requirido cada dos anos. 1. Registration renewals - Your gas-powered vehicle needs a Smog Check if it is more than six model years old, but newer than 1976 Motorcycles, some hybrid models, and two-cylinder engine vehicles are exempt. 2. Change in ownership – When buying or selling a vehicle more than four model years old. 3. Out of state vehicles – When bringing in any vehicle for registration in California, regardless of model year. 4. Retest after repair – If your vehicle fails a smog check and then is repaired, it must be retested. 1. Renovar la registacion- Vehiculos de gas necesitan un Smog Check si es mas de seis años viejo del año del modelo, pero mas nuevo de 1976. Motocicletas, carros hybrid y carros de dos cilindros son exentos. 2. Cambio de priopiedad- Cuando va a comprar/vender un vehiculo mas de cuatro años de el año de el vehiculo. 3. Vehiculos fuera de estado- Cuando traen cualquier vehiculo para regisrarlo en California, no importa que año. 4. Smog check numero dos despues de reparos- Cuando su vehiculo falla el primer chequeo se smog tiene que volver para una segunda prueba. Napa Smog Test Only somete los resultados electronicamente a el DMV por uds. - No hay necesidad de mandar sus resultados por correo. A: At Napa Smog Test Only, we will give you the detailed report generated by the testing equipment. Take the report to a repair shop of your choice. Once the repairs are complete, return to Napa Smog Test Only and get a retest for only $20. We will send the results to the DMV for you. En Napa Smog Test Only, le damos un reporte detallado generado por nuestro equipo del examen. Lleve el reporte a un taller de reaparaciones de su eleccion. Una vez que las reparaciones se hayan completado, vuelva a Napa Smog Test Only y reciba el segundo examen por solo $20. Nosotros mandaremos los resultados al DMV por uds. A: The Consumer Assistance Program (CAP) provides financial assistance to repair or retire a vehicle that fails a Smog Check. You can choose to repair or retire the vehicle. Napa Smog Test Only has the information and forms you will need. Repair Assistance — If your DMV renewal notice requires a Smog Check at a STAR Certified station, you may qualify for up to $500 in repair assistance once you pay the first $100 in repair costs. You may also qualify if your income is within certain levels, regardless of where you got your Smog Check. If you qualify based on income, a $20 co-pay is all that you need. El Programa de Asistencia al Consumidor (CAP) proviene asistencia para retirar/ reparar el vehiculo que fallo el examen de smog. Puede escojer de reprar o retirar el vehiculo. Napa Smog Test Only tiene la informacion y el formulario que necesita. - Asistencia Financiera- Si su formulario del DMV requiere su examen de smog en un lugar "STAR Certified", uds pudiera calificar para qu el estado pague hasta $500 en asistencia de reparos si uds paga los primeros $100. Puede ser que tambien califique basado en ingresos. Si califica, nomas tiene que pagar los primeros $20. - Retirar su vehiculo- Si su carro no tiene valor para reparalo, el estado puede comprar su carro por $1000 y tenerlo desechado en un lugar especifico. El Programa de Examenes de Smog a reducido mucha polucion del aire que es creada por millones de carros en California. Conforme a la Agencia de recursos de Aire de California, el programa elimina mas de 400 toneladas que forman contaminantes de smog en el aire de California cada dia. El estado de California licensia, inspecciona y maneja el programa por medio de La Officina de Raparaciones Automotrices (BAR). "Thanks for taking my car at the last minute - done before my coffee cooled. I would have missed my deadline if I had waited another day. It was fast and easy - don't know why I delayed! I'll be back - but probably late as usual. Great service!" Two Percent Randomly Selected - As required by State law, two percent of the vehicles in the Enhanced Areas are directed to STAR stations for their Smog Checks. These vehicles are selected randomly to evaluate the overall effectiveness of the Smog Check Program. How Motorists are Notified - The DMV notifies owners of vehicles that have been selected to have their Smog Checks performed at Test-Only stations. The registration Renewal Notice sent for these vehicles will say "Smog Certification Required at Test-Only Center".